Sales down 5.5 percent last year. 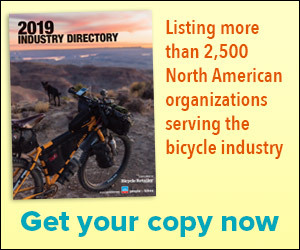 TAICHUNG, Taiwan (BRAIN) — Revenue at Giant Manufacturing, the world's largest maker of bicycles, slumped last year driven down by weak sales in China and lower sales in the U.S. as high inventory levels and heavy discounting took its toll. CAPE TOWN, South Africa (BRAIN) — Protective gear maker Leatt Corporation recorded sales of $16.4 million last year, down from $18.3 million the year before. The company recorded a net loss of $455,000 last year. The company is headquartered in South Africa and its stock is traded on OTCQB market. SEATTLE, Wash. (BRAIN) — REI revenues were up 5.5 percent last year, to $2.56 billion. The co-op returned a record $193.7 million in member dividends and credit card rebates and gave back nearly 70 percent of its profits to outdoor community projects and organizations. HEERENVEEN, Netherlands (BRAIN) — On the strength of e-bike sales in Europe — especially in Germany — Accell Group's sales last year were up 6 percent, breaking the one billion-euro barrier for the first time in company history. MONTRÉAL (BRAIN) — During an earnings call Thursday afternoon East Coast time, Dorel executives reassured financial analysts that despite revenue losses in the cycling division, the company is working on maintaining profitability through a number of moves including price increases at Caloi, inventory reduction to improve margins, and cost cutting through restructuring. MONTRÉAL (BRAIN) — Dorel Industries reported a decline in fourth-quarter revenue in its cycling division Thursday. Revenue was down $18.4 million or 7.3 percent to $235.3 million, the company said. SCOTTS VALLEY, Calif. (BRAIN) — Fox Factory Holding Corp. is reporting a 16.6 percent increase in revenue in its fourth quarter, capping a nearly 10 percent increase in sales for the company's full fiscal year, which ended Dec. 30, 2016. OLATHE, Kan. (BRAIN) — Garmin Ltd. this week reported a 10 percent jump in fourth-quarter revenue fueled in part by strong sales of wearable devices like its Fenix adventure watches and Vivofit activity trackers. Company announces impairment charges for Pearl Izumi USA. Forecasts less than percent growth in bike-related business in 2017. OSAKA, Japan (BRAIN) — Shimano's worldwide bicycle-related sales slumped 17.4 percent in the company's fiscal 2016 to 259,455 million yen ($2.27 billion), while operating income in that segment declined 27.5 percent, the company announced Tuesday. Enve and Mavic sales top $160 million for the year. HELSINKI (BRAIN) — Amer Sports' cycling sales, through its Mavic and Enve brands, were up 8 percent last year, to 150.2 million euros ($160 million), up from 138.5 million the prior year. SAN MATEO, Calif. (BRAIN) — GoPro Inc. on Thursday reported a widened fourth-quarter net loss of $115.7 million — its fifth consecutive quarter in the red — and a full-year loss of $419 million. Company looking to omni-channel sales to compensate for reduced specialty retailer sales. HEERENVEEN, Netherlands (BRAIN) — Sales of performance e-bikes continue to drive sales increases for Accell Group, the parent company of Raleigh, Diamondback, Haibike and other bike brands.